향나무는 우리나라 중부 이남을 비롯해 울릉도와 일본 등지에 분포하고 있으며 강한 향기를 지니고 있어 제사 때 향을 피우는 재료로 쓰이거나 정원수, 공원수로 많이 심는 나무이다. 뚝향나무는 향나무와 비슷하지만 똑바로 자라지 않고 줄기와 가지가 비스듬히 자라다가 전체가 수평으로 자라는 것이 다르다. 안동 주하리의 뚝향나무는 나이가 500년 정도로 추정되며, 높이 3.2m, 둘레 2.25m의 크기이며 가지가 아래로 처지는 것을 막기위해 37개의 받침대를 세워서 관리하고 있다. 조선 세종(재위 1418∼1450) 때 선산부사를 지낸 이정(李楨)이 평안북도 정주판관으로서 약산성 공사를 마치고 귀향할 때 가지고 와서 심었던 세 그루 중 아직 남아 있는 한 그루라고 하며,『노송운첩』에 이에 대한 내력이 실려 있다고 한다. 안동 주하리의 뚝향나무는 오랜 세월동안 조상들의 관심과 보살핌 가운데 살아온 문화적·생물학적 자료로서의 가치가 높아 천연기념물로 지정·보호하고 있다. 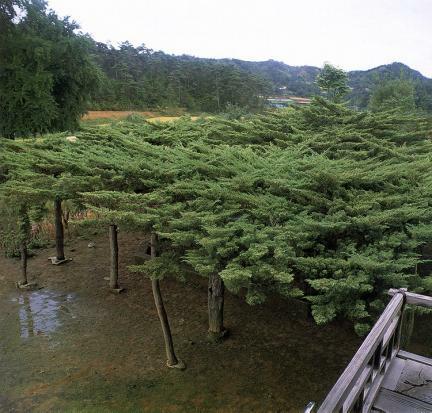 Chinese juniper grows around the middle regions in Korea including Ulleungdo Island. It also grows in Japan. 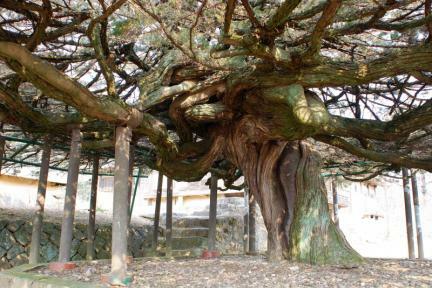 The one in Juha-ri is about 500 years old, with height of 3.2m and girth of 2.25m. 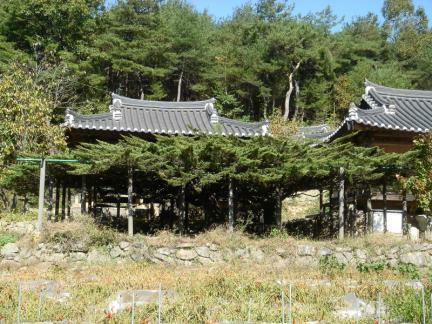 To prevent its branches from drooping, the authorities have set up 37 buttresses.During the reign of King Sejong in the Joseon Dynasty, there was a person named Lee Jeong who served as governor in Seonsan. 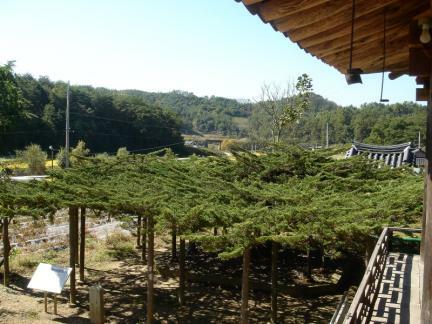 When he finished the construction of Yaksanseong Fortress as administrator in Jeongju, Pyeonganbuk-do and came home, he brought 3 trees and planted them. One of the three still survived. 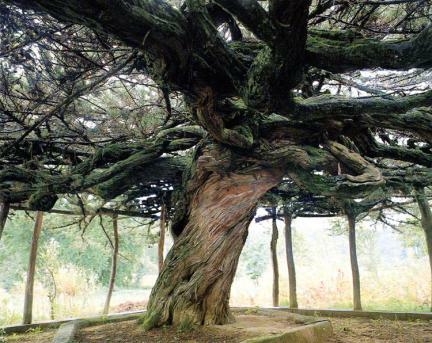 The Chinese juniper tree in Juha-ri, Andong, has grown under the attention and care of our forefathers for a long time, and it is highly valued biologically and historically. Therefore, it is designated and protected as a Natural Monument.